Author’s Note: Although the remainder of the Australian and India Odyssey stories were date-stamped in near real-time, for authenticity, they were actually written in September of 2016 from my notes as well as via use of my many photos and videos as reminders of what occurred. The date on this blog entry reflects when it was actually written. My stated journey to investigate the building of the Australia-bound Rosmech R6 regenerative air sweeper was at an end. 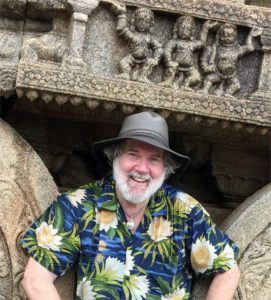 However, since I had not been to India before, I had planned my trip to allow for several weeks of travel in order to further investigate this mysterious (to most Western readers) country that is poised to establish itself as a world leader in the coming decades. After visiting Roots, I traveled for an additional three weeks throughout Southern India. One of my goals was to meet with 36-year-old Sunil Yadav, a street sweeper employed with the Brihanmumbai Municipal Corporation (BMC), which is located in Mumbai, my departure city. “Yadav, who grew up in a slum with a father who was a street sweeper, gained his PhD in social sciences. He declared that he now wanted to “deeply study the social system that has marginalised our (sweeper) class in the society.” And, even after securing a good societal rank, Yadav wants to continue with his job as a sweeper. Alas, I was not able to make this connection occur. While I traveled I kept on a constant lookout for mechanical street sweepers. However, the combination of a large population that needs work such as manual sweeping, combined with the fact that most roads in India are not the type with curb-and-gutter, means most sweeping is done by hand. As a result, all I saw during my three weeks of travel were individuals sweeping with a broom and utilizing a dustpan and, typically, some sort of cart-like container in which to put their collected debris. Most all the roads I encountered had dirt shoulders, which is what was being swept in most instances. I did collect for my readers a sampling of the ‘Sweepers of India,’ though. You may see them by clicking on the media link shown below. Speaking of debris removal… India has apparently not developed a comprehensive system of garbage pickup and/or recycling. Yes, there are dumpsters here and there; however, all of these I saw were overflowing with debris, often with dogs and/or cows and/or goats and/or pigs and/or chickens picking through the spillover in hope of finding random bits of food. In Mysore I even encountered a pile of mostly plastic castoffs and wrappers on fire next to a too-full dumpster. I bet you will be surprised to find out what my rickshaw driver told me about why and how this basically non-flammable debris was burning. Suffice it to say that this is clearly an area where India has a long ways to go. Not that the United States, Europe and other ‘first world’ countries are doing all that well with garbage disposal and recycling programs, either. Still, seeing the depth of the litter/debris problem in India, such a fast-rising industrial powerhouse, I found dismaying. Use the media link shown below and you’ll see what I mean. The photos are not ‘cherry picked;’ rather, they are indicative of the amount of litter seen throughout the Indian countryside. It is also extremely hot in India. While I was there a heat wave occurred that made some parts of India even hotter than usual in this era of rising temperatures worldwide. As an example: When I was considering taking a flight to New Delhi in order to visit the Taj Mahal I looked up the weather there to see what to expect. In Fahrenheit, the temperature expected the day I would arrive was forecast to be124.8-degrees, too hot for my Pacific NW body to want to do sightseeing, I decided. The extreme heat also means one must drink a lot of water in order to remain hydrated. For a ‘rich American,’ this is not an issue; each day, I bought one or two liters of water at about 50-cents each. However, at 66 Indian rupees to the U.S. dollar, that amount of money is out of reach for many Indian citizens. As informal research, I asked several educated Indians I met what percentage of their citizens they thought would be able to, and would, buy a liter of water each day. The responses came back between 25% and 35%. Since there are few other sources of clean, healthy drinking water available, one has to be concerned about the health of the 65-75% of the people not able to access clean water. In my travels my rickshaw driver guides pointed out several water flows in concrete-lined canals where they said the government was providing clean water for drinking. Further along, these canals often were filled with animals, people washing clothes and the like. Within my second week, when people asked me, as many did, what I liked best about India, my frank answer pleased them no end: “The people of India,” I would truthfully respond. There’s something about the Indian people that provides me with hope for the future, no matter the relative poverty in which most of them live. Perhaps its because many believe in reincarnation, but for whatever reason I found a spirit and beauty in the souls of those I met that I’ve seldom seen elsewhere. If you watch the slideshow perhaps you’ll catch a glimmer of what I mean. BTW, the slideshow extra is a quick drive through one of the open air food markets in Mysore. Especially for those of you who have never been to India — although if you have been you may well want a reminder — I also made a slideshow of some of my favorite photos from the trip. These offer a quick gallop through just a few of the many places and sights I saw in my whirlwind adventure on the road in Southern India. Another visual treat: Mysore is the site of the fantastically beautiful Mysore Castle. This is an enormous tourist draw but because it costs some Rupees to get in, citizens visit more rarely. However, on Sunday nights, which is when the lights of the Castle are lit and an English-themed brass band plays, the Castle’s gates are opened to all at no charge. The impact of all the lights and the scope of the Castle itself are a stunning combination. Use the linked video below if you want to see a bit of the spectacle. My guess is that you, like me, have never seen how incense is made. Here’s a brief video that shows the technique used for a single woman worker to make between 6,000 and 7,000 sticks of incense in a single workday. Care to take a tour of an entirely different sort? Here’s one of an old highway roller I spotted somewhere along the way. It’s a vintage beauty! Finally, for you ‘foodies’ out there: Here’s a video tour, conducted by a knowledgable Indian guide, of an area of Mysore’s central outdoor food market. You’ll see the origin of some vegetables and seasonings you probably have used in your kitchen but may not have known how they looked straight from the farm. I hope you enjoyed sharing in my travels to Australia and India in search of new information surrounding power sweeping and much more. Many thanks to my traveling companion for much of the journey, international sweeper consultant, Malcolm Cameron. For a better understanding of the fun it was traveling with Malcolm, be sure to read the many ‘Malcolmisms’ he sprinkled into his conversation during our travels.